The following fund has beat any odd with no down years up till 2010. 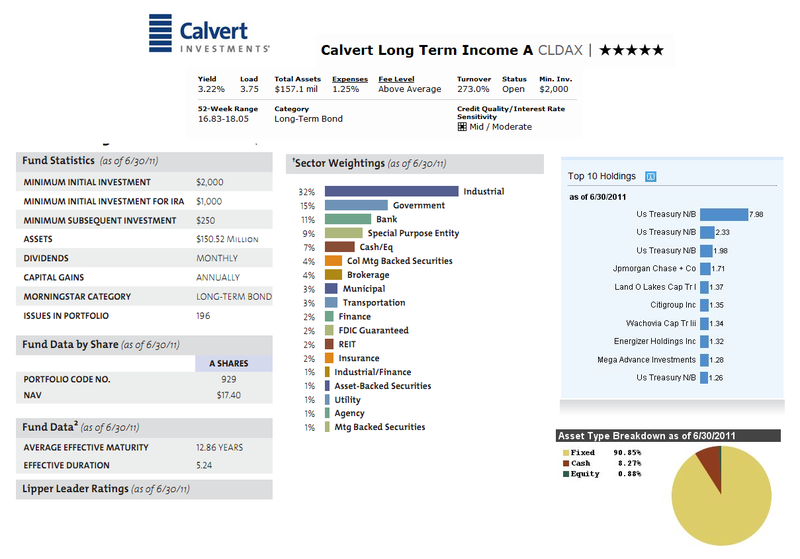 Calvert Long Term Income fund is rated as one of the best taxable bond fund. It is also managed by Gregory Habeeb. The fund's review and details are listed below. The Calvert Long Term Income investment fund seeks to maximize income, to the extent consistent with preservation of capital. It invests through investments in longer-dated securities. The fund usually invests > 65% of net assets in U.S. dollar-denominated investment grade debt securities. The debt obligations consist of U.S. corporations and US government bonds. This Calvert fund may invest in securities that represent interest in pools of mortgage loans or other assets assembled for sale to investors by various U.S. governmental agencies, and private issuers. Since its inception in December 2004, Gregory Habeeb has been the lead manager of this fund. He is the Senior Vice President for Calvert’s table fixed income portfolio. This long term bond fund has sales-load fee of 3.75% and 12b1 fee of 0.25%. The last dividend distributed in June 2011 ($0.05). The fund’s dividend yield is 3.24% and it is distributed monthly. If there are any capital gains, they will be distributed annually. It also has an annual expense ratio of 1.25%. This expense fee of this best fund is higher than the average in the Long-Term Bond category which is 0.89%. CLDAX has returned 3.51% over the past one year, 10.28% over the past three years and 9.44% over the past five years. This top rated bond fund has continuous 6 years in achieving positive return since its inception. The highest return so far was in 2009 with 17.09% and the lowest in 2006 with 5.43%. Currently, the fund’s year-to-date return is 3.81%. This fund has gained 4-stars return rating from Morningstar. This Calvert Long Term Income fund requires a minimum of $2,000 to open a brokerage account in this fund with $250 of minimum subsequent investment. For IRA account, the minimum initial investment required is $1,000. This Calvert Investments fund can be purchased from 86 brokerages such as Merrill Lynch, JP Morgan, Vanguard, Schwab Retail, Ameriprise Brokerage, Raymond James, Prudential Retail, Edward Jones, Scottrade Load, TIAA-Cref NTF, etc. There is no other class available for this CLDAX fund. The benchmarks of this CLDAX fund are Barclays Capital Long U.S. Credit Index and Lipper BBB-Rated Corporate Debt Funds Index. The top sector weightings of this Calvert fund as of June 2011 are Industrials (32.17%), Government (14.81%), Bank (11.35%), Special Purpose Entity (9.04%) and Cash/ Equivalents (7.20%). And the assets type breakdown is 90.85% in fixed, 8.27% in cash and 0.88% in equity. According to the fund’s prospectus, the fund’s Principal Risks are: Non-Diversification Risk, Credit Risk, Mortgage-Backed and Asset-Backed Securities Risk, Management Risk, Interest Rate Risk, Junk Bond Risk, Defaulted Bonds risk, Unrated Security Risk, Corporate and Taxable Municipal Bond Risk, Collateralized Mortgage Obligation risk, Foreign Securities Risk, Foreign Currency Risk, American Depositary Receipt Risk (ADR Risk), Repurchase Agreement Risk, Active Trading Strategy Risk, Futures Contracts Risk, Leverage Risk, etc.